What was your single favorite thing that your parents cooked when you were growing up? Was it some kind of special pasta? Or maybe your mom cooked chicken a way that no one else has ever been able to replicate? Because my parents happen to be quite adept in the kitchen, I could probably list 20 different dishes that are deeply ingrained in my memory. However, if I had to name just one, there's a particular dish that has always stood out: I grew up eating the best eggs benedict most people have ever tasted. My dad only makes it a couple times a year, for special occasions, but his experience making hollandaise and poaching eggs in real kitchens is evident on the plate. Luckily the master trained his pupil in the art of emulsion, and I’ve been known to make a pretty mean eggs benedict as well. What I’m trying to say is…Bobby Flay, it’s time for a throw down. Just you and me, face to face, mono e mon - no crew, no audience, no clothing, no rules. No, no, what I’m actually getting at is that when it comes to eggs benedict, I have high expectations – expectations which are rarely met. Most restaurants have a knack for screwing up the hollandaise, so although it’s one of my all-time favorite things to eat, I rarely order it. Until today. Enter Local: Mission Eatery. If every restaurant cooked eggs benedict the way it’s done at Local: Mission Eatery, I’d probably eat it for lunch and dinner every day of the week. What makes is so incredible? Honestly, everything. First let me preface by saying that asparagus is possibly my favorite vegetable. 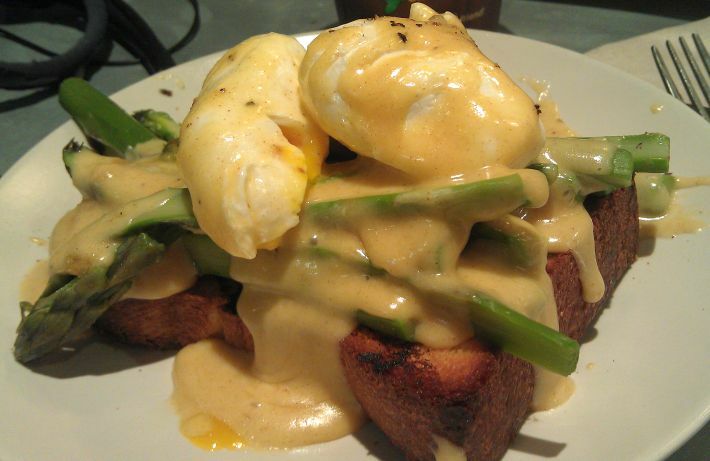 So when I saw “Asparagus & Egg, brown butter hollandaise, open-faced on Knead’s brioche” listed on the menu, I did something completely out of character: I put my uneaten Knead pastries to the side, and ordered this spring version of my favorite dish. A quick note on the asparagus – it comes from Zuckerman’s Farm, known as one of the oldest asparagus farms in the country. During the Second World War, the farm’s focus shifted from labor-intensive white asparagus, to green asparagus. Today, 700 of the farm’s 3,000 acres are dedicated to this crop alone, and its perfect location near the Delta makes Zuckerman’s asparagus the most flavorful, local crop on the market. Getting back to the dish itself. Jake des Voignes cooks up an eggs benedict that is just…well…it’s just perfect. I honestly can’t think of a better word to describe it. Chilled, sliced asparagus piled high and incredibly flavorful; eggs that are perfectly poached so that the yolks ooze out over the plate; I want to eat the hollandaise with a spoon – just pour it right down my gullet – because the unique use of brown butter gives it that special extra something; finally, a thick slice of Knead’s brioche was the perfect foundation, soaking up every drop of hollandaise and all of the yolk’s gooey goodness. I’m literally getting excited just describing it. about it. The dish in its current form is only offered during the spring, on the lunch and brunch menus, and will change when asparagus season comes to an end. I finished eating just as the restaurant was closing and actually had to sit at the counter for another 20 minutes before I could move or function. That dish actually wore me out, and I mean that in the best possible way. I was full, satisfied, impressed, and convinced I'd be back within the week. There's just one problem: I already get my breakfast from Knead Patisserie, located in the same space as Local: Mission Eatery, every single day. Luckily asparagus season will only last another 6 weeks, so I won’t be spending every waking moment in the same place for too long. But, if there’s some kind of emergency before the end of May, you’ll know where to find me. Thanks for that info. I'm going to go there in a day or two to try it for myself! Their online menu does not include eggs benedict. Hey Steve, it's listed as "Spinach and Eggs" on the menu.